The WPF Report Viewer is a .NET reporting tool that displays SSRS, RDL, and RDLC reports within WPF applications. You can export the report to PDF, Excel, CSV, Word, PowerPoint, and HTML formats. The WPF Report Viewer is a .NET reporting tool that displays SSRS, RDL, and RDLC reports within WPF applications. It empowers your application with all major capabilities of RDL reporting such as parameters, variables, expressions, code modules, calculated fields, sorting, grouping, filtering, paging, report linking, drill down (toggle item), drill through, hyperlink and more. You can export the report to PDF, Excel, CSV, Word, PowerPoint, and HTML formats. Syncfusion WPF Report Viewer can render RDL reports published or deployed on SQL Server Reporting Services (SSRS) server and view RDL/RDLC reports that are local or embedded in an application without using SSRS Report Server. 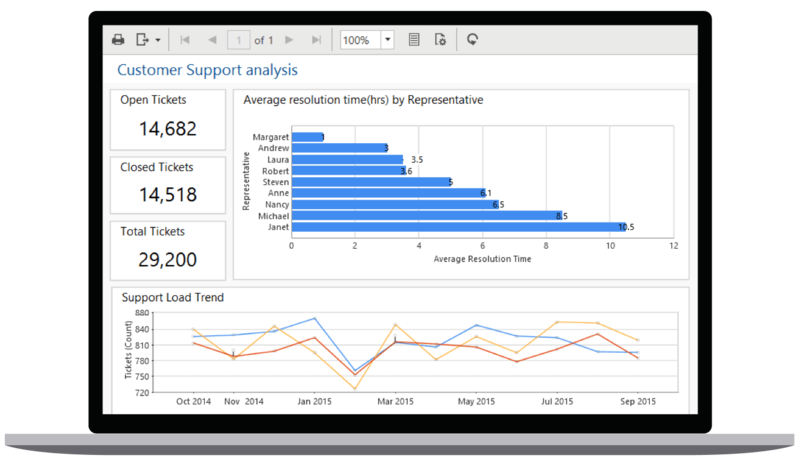 You can work with reports at run-time through RDL reporting features like drill through, drill down, hyperlink, and interactive sorting.